Court Recruitment 2017. Application forms for the Clerk posts available at the official website of Office of the District @http://ecourts.gov.in/hoshiarpur/history. Interested candidates can download the application form from the district recruitment page. Complete application must be reached the office by 27-11-2017 at 05.00 PM. Age of the candidate should be between 18 years to 37 years as on 01-01-2017. Relaxations will be given as per Punjab Govt instructions. 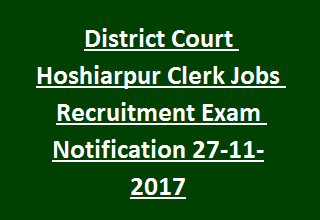 District Court Hoshiarpur Clerk Jobs Recruitment selection is based on candidate merit in written test. Written test for the post Clerk on Adhoc Basis will be held on 13-12-2017 (Wednesday). Fixed monthly emoluments for the post of Clerk is Rs. 10,958/- plus Allowances admissible as per Punjab Govt orders. Full details regarding application filling procedure, Selection, Qualifications, Age limit, written test details of Office of the District & Sessions Judge, Hoshiarpur Recruitment of 10 Clerk Jobs are mentioned below. Total vacancies available in Hoshiarpur District Court Recruitment are 10 posts. Post Name: Clerk (on Adhoc Basis): 10 posts. Candidate must possess Bachelor Degree qualification in Arts/ Science or equivalent from recognized university. Must have passed Matriculation with Punjabi as one of the subject. Monthly Salary for Clerk posts is Rs. 10,958/- in the pay scale of Rs. 10,300/- to Rs. 34,800/- plus Rs. 3200/- Grade Pay. Age of the candidates for Clerk Jobs is between 18 years to 37 years as on 01-January-2017. Age relaxations applicable as per Punjab Govt instructions. Candidates will be selected for Clerk jobs is based on marks obtained in written test. Written Test will be held on 13-12-2017. Application forms for Clerk Vacancies available at Hoshiarpur Dist official website http://ecourts.gov.in/hoshiarpur/history. Interested candidates download the application and guidelines from the official website. Complete the Bio-data and submit the application with 2 passport size photographs, attested testimonials to the Office of the District & Sessions Judge, Hoshiarpur before 27-11-2017.